Canadian Blogger: Jan 19/09 Grandpaw Ron Has Blogged for Two Years! Hello world! « Effects Of Gods Love In A Journey In Your LIFE & Reminiscent Stories Of The Past? Short and to the point,eh? Not so with his third post. This writing tells us the bent of Grandpaw Ron's life mainly his Lord and his family. It is oh so beautiful! "Through life I have at least tried to remember the things that was beneficial to me as I grew older ! As a young boy I remember the the times that my great aunt carried all of us grandboys to church! She was one of those loving Aunts that believe in boys being boys ,although she believed that we should be taught there was a time and place for us to do our thing! Now I was raised in a Tradional Baptist church and I don’t know how She carried all 12 boys to church and managed her sanity at the same time? I do remember that she would carry about a five foot peach tree switch and she sat with us where she could reach us with it! You ask, why do I want to remember that ? It instilled in me and my cousins the other values in life that we needed at an early years ! She had certian times of the week for us to study our bible and sunday school lesson and we had all better show up ? One of the reasons we would all show is all of them big plate of homemade cookies with a glass of milk right out of the cow [ only cooled down ] that could touch any growing boy’s heart? My point is that all of our parents and grandparents should not neglect our opportunities to plant the seeds in our childrens hearts while they are at an early age ! If we start at an early age then we don’t have to start when they get older which causes other problems ? Grandparents I challenge you to take up the responsible jobs that your kids are not doing? Pray about it and then accept the challenges God puts on your heart ? Every child an adult should know the story of the Picture above ? I know because I personally have had that experience ? May God Bless YOU "RON. Who would of ever thought that this amazing grace man would be living the words of this January 25 post? "God never quits amazing us and blessings us ? I believe HE new exactlt what I needed to give me inspiration andmotivation in life ? He blessed me with 2 grandaughters which I love dearly that came to live with me on December 12th ! The decision came without choice but God knew what to do in their lives ! He knew I was the only choice between going to unknown Foster parents somewhere in Georgia or blessing me with them ?" Now THIS is what Grandpaw Ron and his doggie , Princess have become! Yerry you arranged the post and photos so brilliantly. Ps 37;27 are meant for a man like Grandpa. 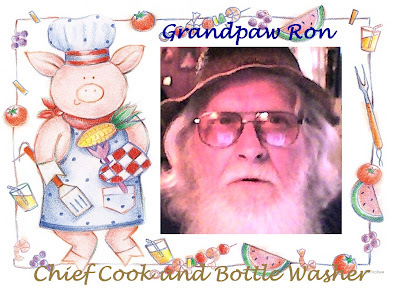 It sure is a blessing to be used and trusted by God in the way Grandpaw Ron has been. Thanks for posting this on my blog anniversary ! I always try to leave myself open to God's Decisions in life ! He killed two birds with one stone as the old saying goes ? He knew what was best for the girls and He also knew what would kick start me and keep me from taking so many naps ? This week started off with an appointment for an evaluation report for the girls on Monday ! Then today I had to meet with a panel review board made up of Thomas County residents and fill out more papers and answer a bunch of questions ? Thanks again because I hadn't had time to post nothing ? Blessings to you and Bernie . PS--I got you in my prayers everyday ? What an a great example your Grandpa Ron!